In the first Grade 5 RGT Acoustic Guitar lesson, we looked at part of the first section of ‘Mourning Air’ – one of the RGT’s Grade Five unaccompanied acoustic guitar exam pieces. This lesson will cover the second section of the piece, which you can see in the tab and video below. Whereas the first section had a very sad melancholic mood, this section sounds much more celebratory and is almost dance-like in style. This section is four bars in length, but is repeated three times – each time getting slightly faster, to make the music sound livelier and more exciting each time. The marking ‘Rall’, towards the end of the third repeat, indicates that the tempo should start to slow down form that point onwards. A descending double pull-off is used several times in this section, as a way of providing a sense of movement and fluency. You should make sure these notes sound as clearly and loudly as normally fretted notes; keep both fretting fingers pressed down before you start to execute this slur – so that the lower note is ready in position. 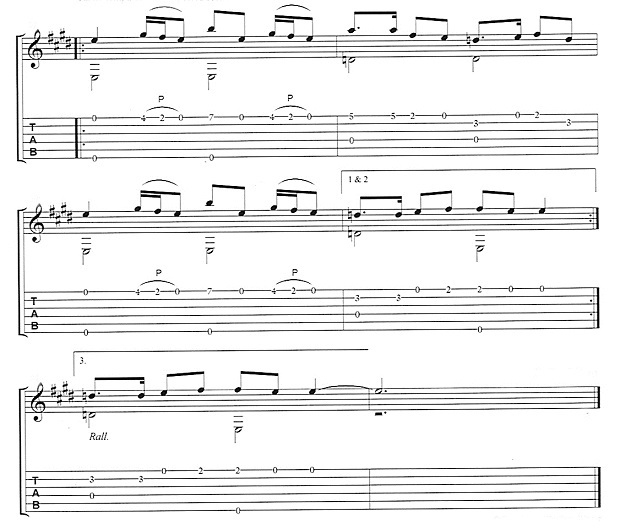 Take a look at the video and tab below to see how this section should sound and be performed. Here is the first 6 bars of the second section to the piece ‘Mourning Air,’ which is covered in the video lesson below. 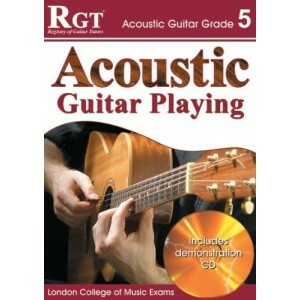 This entry was posted in Acoustic Guitar Video Lessons and tagged RGT Acoustic Guitar Exams by Alan. Bookmark the permalink.